Relax and Read a children’s book! As the mind behind the children’s character Smart Artt and the Artt of Early Learning Series of children’s books and The Early Ed Series, she has devoted her life to sharing the secrets about how parents can build the foundation their child will need for the future success… right from birth. Her extensive background includes over 25 years working with children and families as a nurse home visitor, longitudinal research interviewer, children’s nonprofit Program Director, writer and Coordinator of the nurse home visiting component of a county-wide school readiness program. She has bundled all of that experience into one fun children’s series that will help you transform your child’s future! Currently families in the U.S, Serbia, Algeria, Panama, Brazil, Columbia, Nicaragua, Canada, and the UK are enjoying Smart Artt and The Early Ed Series! Go to SmartArtt.com to learn more, spread the word and take the challenge to start now! 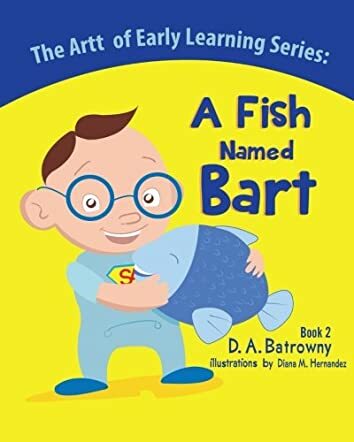 A Fish Named Bart (The Artt Of Early Learning Series Book 2) by D.A. Batrowny is a cute story for little kids. The book covers how each child undergoes developmental milestones as they grow, and how it varies from person to person. The book reiterates the importance of a parent in the growth of a child and its learning. Being the first teachers of a child, the parents' role in a child's development is crucial. Smart Artt has grown from a baby to a one-year-old and he now tries to help others. He meets Bart the fish and helps it to swim and sparkle. Bart is a toy on his mobile and Smart Artt teaches it to return to water, just like in his Grandpa's story. I found the story helpful to parents, especially new parents, as it can be used as a tool when it comes to handling kids. The story stresses the importance of parenting, and the tips for eight-month-olds are indeed very useful. It's a good bedtime storybook that parents and grandparents can read to their kids and grandkids. The developmental tips and advice shared by the author through the story of Smart Artt and Bart will definitely guide new parents while bringing up their toddlers. The story has love, warmth and a good message. The pictures are cheerful and colorful and breathe life into the story, scenes and characters, making it more captivating to kids. It is a lovely storybook for children and an excellent tool for parents who are bringing up small kids. I love the whole idea of this series of easy-to-read books for both parents and their growing babies. As well as a great simple story to read to your child, parents get a simple list of developmental milestones and good activities/ safety tips for their little one at different ages. The story also highlights some of the things that are mentioned (such as taking your child for a walk/ pointing things out, and removing any mobiles if they can now pull up and reach them in this particular book, which is aimed at 8 month olds). Smart Artt has now progressed from being a newborn baby to being an 8 month old whirlwind of mischief. As in book 1, he is trying to help others, and doing mysterious disappearing acts. The fish called Bart comes from the mobile above his head, and Smart Artt helps it to swim and sparkle like the fish do in his story book. As he grows, Smart Artt continues to look extremely cute, and the bright, colourful pictures of him in the story section are ideal for showing to young children. The shirt story itself is also endearing, and will be enjoyed by the parent reading it too. I've only just realised that all the books in the Smart Artt series have titles that rhyme. A clever twist that made me smile, which will also help make them appeal to little ones with a row of the physical books on their bookshelf. 'A Fish Named Bart' has the beautiful simplicity of a deeply researched book. I can imagine little children asking for this story over and over again. Events in the book relate directly to the limited world of a small child, a place where repetition brings a sense of security. For example Smart Artt recognises the walk he takes with Momma and keeps safe. Kids will love spotting the landmarks that mark out the walk and repeating the story of Bart the fish. The clear and cheerful illustrations by Diana M. Hernandez are a huge bonus. D.A. Batrowny has included helpful advice for parents, which I believe will be much appreciated. How well I remember the worry of suddenly being responsible for a little one, 24/7. Without any training! Parenting is such an important job and one that is completely unrecognised and underrated. Well done D.A.! Another splendid book in the Artt of Early Learning Series and Smart Artt helps a fish, Bart, (a toy on his mobile) return to water just like in his grandpa's story. While he's out, his grandma realises he's disappeared and soon everybody's searching for him. A charming story full of love, tenderness and a warm message within that your little slugs will love listening to at bedtime, and with clear, colourful illustrations that can be easily enjoyed and understood. Let's hope there's more to come in the series. Just discovered this delightful series for parents, grandparents, and their young children. In the second book, Artt's grandpa has just finished reading him a bedtime story. The fish on his mobile gets the idea he would like to swim and jump like the fish in that story. So clever Artt devises a plan to get Bart outside to make his wish come true. Illustrations in this book are large, simple and bright which make them perfect for toddlers and preschoolers. The text is appropriate and pairs well with the pictures. I just love the glasses Artt wears. As a bonus, the author supplies a list of developmental milestones appropriate for an eight month old child like Artt in this story. This series promises to be one that is fun for young children and informative for their caretakers. I recommend that you take a look. The story was an adorable adventure, just right for your little one. I loved the bright and cheery illustrations! Very well done. Looking forward to the next one! The infant stages tips were also great!